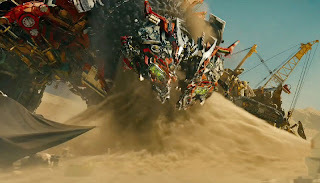 Between it's massive opening last week and the run-up to the Fourth of July weekend over the next few days, expect Transformers: Revenge of the Fallen to scarf down an unconscionable amount of coin (much like Devastator, left), its place as one of the top grossing movies of 2009 well assured. That's regardless of how it is also one of the worst reviewed movies of the year! I'm going to see i for my second time tomorrow. Far as I'm concerned, it deserves the money it's raking in. Damn good movie. "Personally, I don't care that it's got so many problems artistically." "It's giant transforming robots beating the crap out of each other with lots of earth-trembling explosions." ...and why didn't you like Terminator Salvation? How was that movie too loud for you if you liked Transformers 2? In my opinion, Transformers 2 made T4 look like it should be up for Oscars or something. "What more is it supposed to be?!"